After what felt like an eternal winter, the snow is finally melting and the winter coats are safely stowed away. We were beginning to think Toronto had forgotten the element of warmth. At last, spring is here and I can confidently tell you that because my eyes are starting to itch, cue the Reactine. Runny noses and bloodshot eyes aside, what better way to welcome the spring weather than with the 2014 Infiniti QX60 Hybrid, a luxury crossover that comfortably seats a family of seven, with a large trunk to spare. Road trip anyone? Did I mention that this particular QX60 is a hybrid? You might even drive past one and not even realize its housing a 2.5L supercharged 4-cylinder engine with a 15kW lithium ion battery. This in part is due to Infiniti's use of subtle hybrid badging. There isn't even a hybrid badge at the rear, only on the side fenders. Infiniti understands that green leaves and eco-colours are not the most attractive of logos, and rarely do you see someone flaunting their hybrid. We just want them to look like the original, while keeping our wallet chunky. This is something that Infiniti does right. I just wish they also took a page from the Lincoln MKZ, where the hybrid model costs the same as the gas engine model. The 2.5-liter supercharged inline 4-cylinder engine, combined with a 15kW electric motor is good for 250 horsepower, with 243 lb-ft of torque. 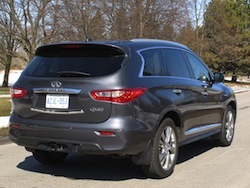 Quite similar numbers to the 3.5-liter naturally aspirated V-6 QX60 that delivers 260 horsepower and 248 lb-ft torque. 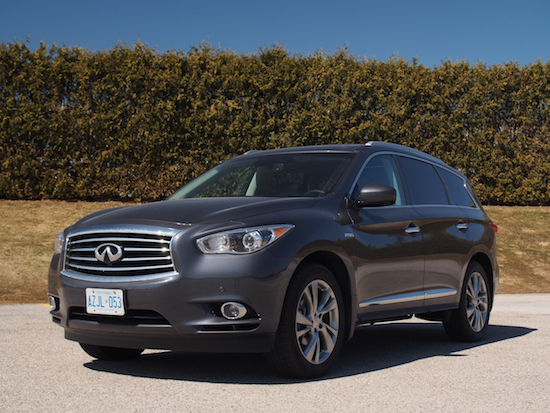 You won't feel a difference either as the supercharger makes the QX60 Hybrid feel like a V-6 rather than a 4-cylinder. While it surely isn't the fastest of the herd, the 4625 lb whale provides a supple ride with a fluffy suspension and 20-inch all-season tires. No need to swerve around those potholes anymore, just ride on through. Lodged in the center console is a four-position driving mode selector that allows you to choose between Snow, Eco, Standard, and Sport modes. Standard mode says it all in the name, steady revs and smooth acceleration. Sport mode in a hybrid never made too much sense to me, but the longer gears and quicker throttle response admittedly help in highway takeovers. Not surprisingly, I found myself in Eco mode most often. 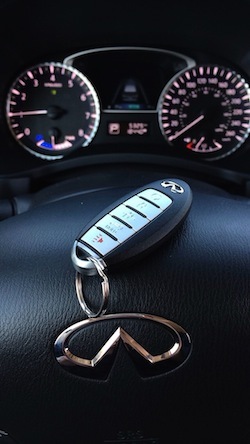 The transmission keeps the revs low, and the gas pedal gives feedback and physically limits throttle movement when accelerating too quickly or "unefficiently". Nevertheless, the real question floating around is if the smaller engine and hybrid gizmos save us enough fuel to justify its $11,500 premium over the V-6 variant. Let's be frank, the answer is no. Despite Infiniti giving us mileage numbers of 7.6 and 6.9 L/100km for city and highway respectively, we could not even come close to those conservative numbers on our week-long test drive. We attained a combined average of 12.1 L/100km, and this was entirely in ECO mode. Quite disappointing. The 2014 model wears the same suit as its 2013 counterpart, other than the JX badge morphing into a QX. 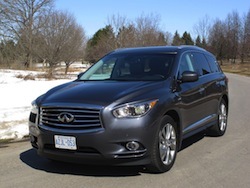 Infiniti loves big grilles, and the QX60 Hybrid is no exception. Its bulbous body curves don't bother masking the size of the w̶h̶a̶l̶e̶ vehicle either. Inside, the cabin is nicely tailored with soft materials with slight hints of hard plastic here and there. 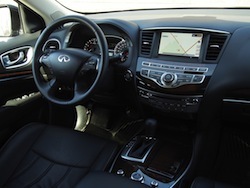 The seats are snug and the heated 4-spoke leather steering wheel does the trick, though I still prefer the 3-spoke found in the Q50. Now those fit like a glove. Infiniti takes pride on the fluidity in which you can access the rear seats. The second row has a sliding lever that makes it incredibly effortless to hop in and out the third row, no acrobatic moves required. Each row also has copious amounts of legroom and headroom, enough for a 6-footer to sit comfortably for hours at a time. The second and third row seats also sit higher than the front row for a greater sense of spaciousness. All the 2014 QX60 Hybrids come standard with a $5000 Premium package (included in the base price) that consists of Infiniti's intelligent all-wheel-drive, leather upholestry, automatic climate control, heated front seats and heated steering wheel, power moonroof, push-button ignition, power tailgate, automatic LED headlights, and a vibrant 8-inch touchscreen with an infotainment system that is lag-free and intuitive even for those who are not too tech saavy. Also included is a 13-speaker Bose sound system that gives Bang & Olufsen a run for their money. Analogous to the Q50, the speakers are strategically placed all around the cabin to deliver one of the best surround sound atmospheres we've had the chance to experience, bar none. Note the lack of BOSE logos and the pocket-size speaker on the front dashboard that seems a bit out of place. While it feels like Christmas morning with all these standard features, the actual options sheet is rather light. The only option that you can choose from is the $9000 Theatre, Deluxe Touring, and Technology Package, and it's a big one. Dual 7-inch DVD monitors mounted on the headrests to entertain the kids, 20-inch wheels, heated rear seats, heated and cooled front seats, a fixed moonroofs for the second and third row, and a warehouse of safety technology. Lane departure warnings, backup and forward collision intervention, blindspot warnings, and brake assist, it is almost impossible to crash this thing. 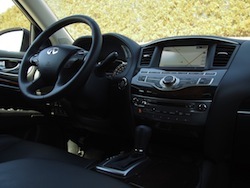 The 2014 Infiniti QX60 Hybrid sure has plenty to offer. 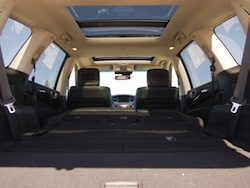 A myriad of standard features, a vast field of storage space and enough seats to haul a soccer team. It houses a cinema-quality sound system and delivers a supple ride that makes the commute feel like a journey rather than a chore. The dilemma here is the $11,500 premium for the hybrid model that aims for fuel efficiency, but lands wide. 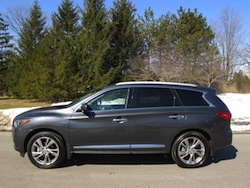 Though, the QX60 Hybrid proves to be a more affordable competitor against its fuel-efficient SUV rivals, and with the $64,490 BMW X5 35d and $63,200 Audi Q7 TDI peering down its shoulders, the QX60 Hybrid may provide just enough on the silver platter to land you on its front seat.